Back in the late 1980s, I was lucky enough to have a guitar lesson with Mike Stern. I would also see him play fairly regularly and have a talk over a cup of coffee (Sheridan Square Diner (r.i.p.) ). Mike recommended a book to me by a guitarist whose name I had only seen in Guitar Player magazine, but had never heard. The book was called the George Van Eps Method for Guitar and it was published way back in the 1930s. I bought the book and did the first few pages of exercises. In reading George’s words in the forward, I understood that the book was not only a way of learning triad shapes in all inversions on all string sets, but also as a way of developing an independence in the digits to enable single note playing over sustained chords. This was a hallmark of George’s style, which was developed as a young tenor banjo player (his father, Fred, was one of the instrument’s great virtuosos). I revisited the Van Eps method pretty heavily around 2000, as I was playing a lot of acoustic archtop guitar. Now I had heard George and was profoundly inspired by his playing. I can hear where Mike Stern utilizes some of the concepts he learned from the book, particularly when he is playing a pedal note and moving the chords around underneath. Anyway, years later it occurred to me that working through inversions of the triads in a Van Eps-ian manner might be a fruitful exercise. I continue to utilize it daily. If you have a lap steel tuned to C6, you can find the triads within. This would also work for any other tuning, as well. You will have to make your own adjustments to the tab that I’ve laid out. I highly recommend mastering exercises #1 and 2 in every key before moving on to the triad inversions. There are other techniques involved in the inversions that will need to be addressed. 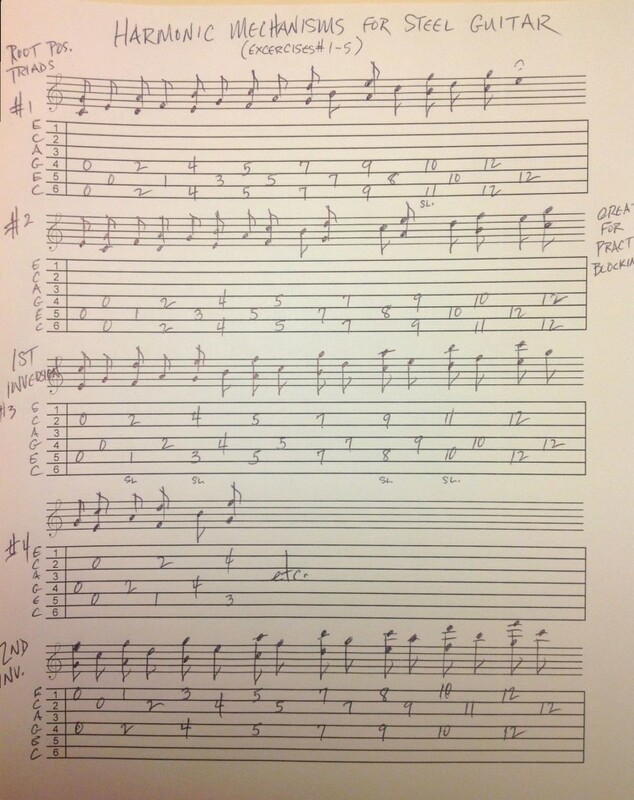 This page of exercises was written quickly by hand while the idea was fresh. Please pardon the sloppiness of it. Here is a quick video demonstration of the concept. Note that I do not lift the bar off the strings, but simply block, using either method (palm or pick). Pick blocking is particularly useful in arpeggiating the triads. Practice these slowly and cleanly. I’ve also created a little clip showing how to utilized the triads on strings 1-3 in A6 tuning. This works so well that I’m almost tempted to switch to A6!